On a whim, at the end of May, Bob and I decided to organize a short stay in Algonquin Provincial Park in Ontario, on the heels of another commitment that took us to the area. We opted to book a yurt at the Mew Lake Campground, never having experienced that type of camping before, and spent three glorious days scouting out birds and wildlife. What a thrill to have the opportunity of photographing 4 Red Fox kits (Vulpes vulpes) that were only about 4 weeks old. On one hand, we were grateful to have a solid roof over our heads at night, with an electric heater, because the temperatures dipped to just above freezing, but we were just as glad that the weather was on the cool side because it helped to keep at bay all the hordes of mosquitoes and blackflies that plagued us while we sat for interminable lengths of time observing the antics of the fox kits and their mother. 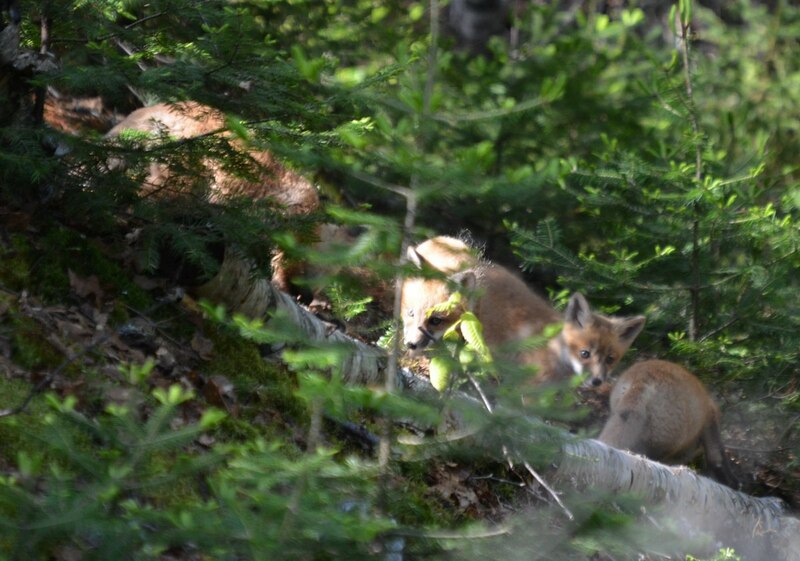 Our first glimpses of the young family were through a dense screen of balsam branches on a far ridge, and although we had difficulty getting any clear shots of the handsome babies, their curiosity had them peering through the boughs at us. Once the kits became accustomed to our presence, they were quite content to carry on with the playful games that entailed chasing one another, exploring their surroundings and burning off an excess of energy. 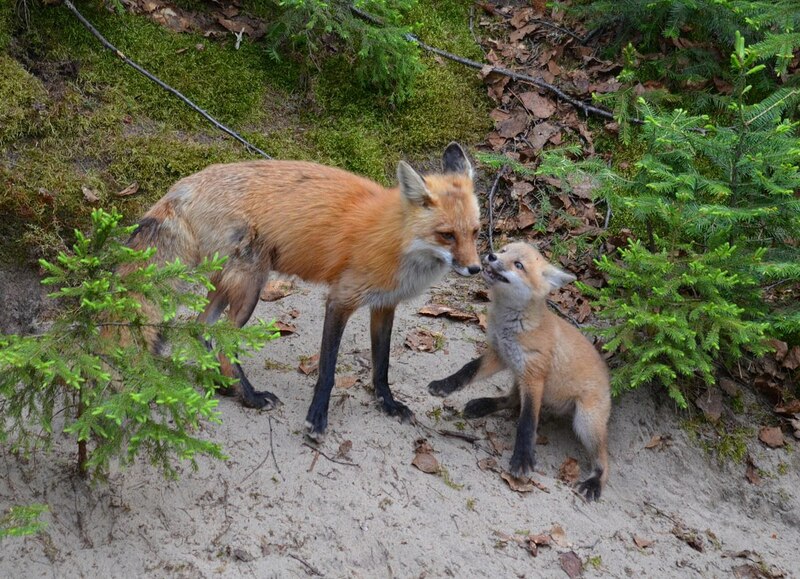 The vixen kept a close eye on her young babies but finally was sufficiently at ease that she left the kits in search of food. 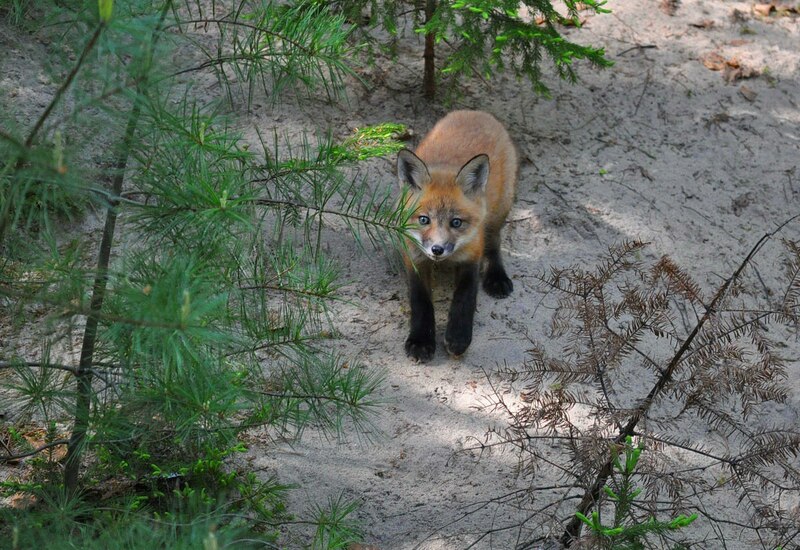 A pair of adult Red Foxes mate sometime between January and March, and it is just shy of two months later that their litter of cubs is born, anywhere between 2 to 12 babies but more commonly around 4 to 6 kits. Fox kits are blind when born because they are incapable of opening their eyes, deaf because their ear canals remain closed, and toothless. After about 14 days, both their eyes and ear canals open, and the cubs’ upper teeth emerge; the lower set of teeth erupts three or four days later. 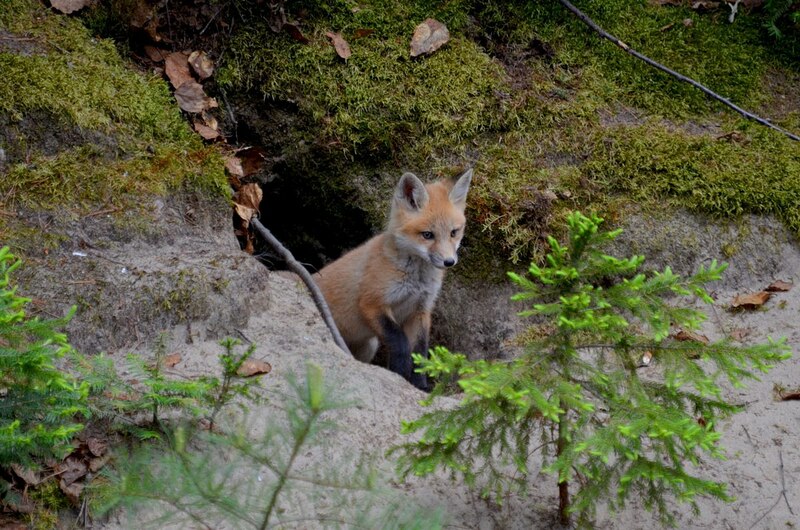 For the first two or three weeks, the newborn kits are cared for in the den by the vixen during which time, she relies on the male Fox, the dog fox, to supply her with food. Her constant presence is required because the young babies are not yet developed enough to be able to regulate their own body temperature. After about four weeks, the cubs venture forth from their den ready to take on the world. It is around this tender age that more noticeable physical changes start to occur. At birth, a kit’s fluffy fur ranges in colour from grey to dark brown, but within 3 weeks, it begins to change. Soon, the kits are showing red and white patches on their faces, with a fresh red coat covering their bodies by the end of the first month. A kit’s eyes are initially blue and gradually change to amber over the course of another week or so. 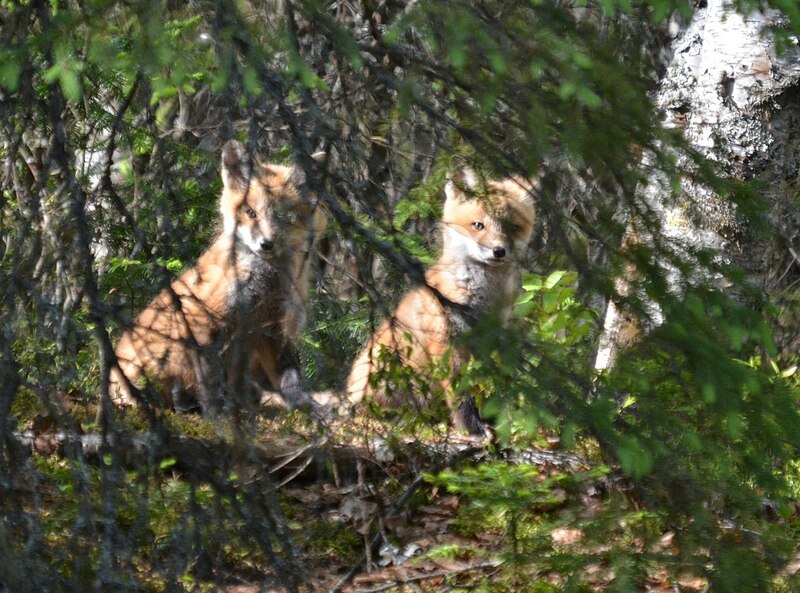 Bob and I had loads of time to observe the four fox cubs even though they did disappear by times down into the den or wander into the underbrush in search of their mother. As they peered at us behind our cameras, we noticed how a faint black streak was beginning to show itself around the eyes, and the ears, which were folded at birth, were noticeably erect. No longer did the kits have that short, puppy-like nose. 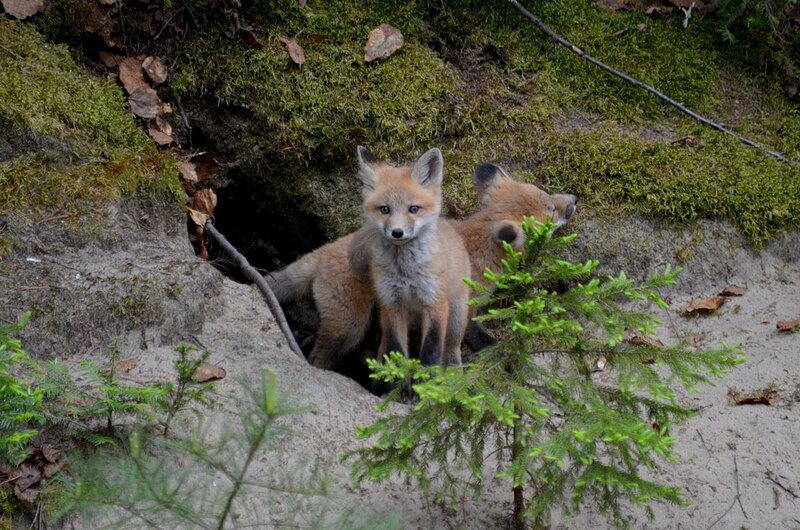 Instead, their snouts were growing longer and resembled that of the adult fox. 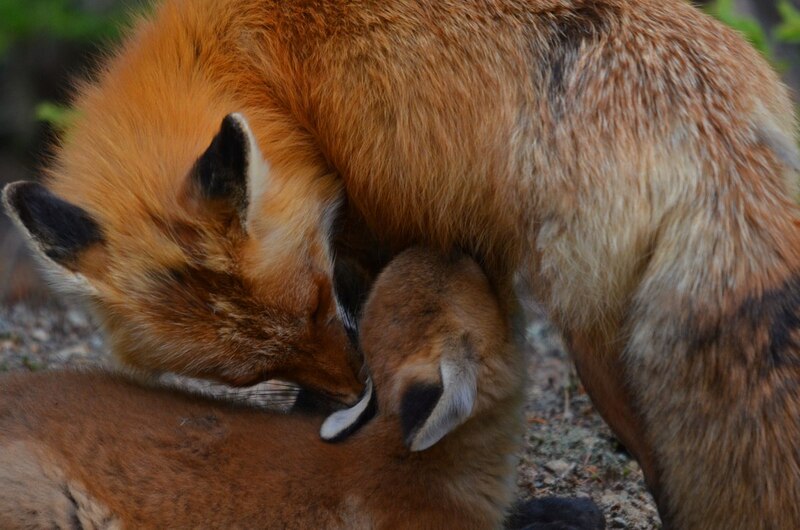 Of course, like any mammals, Red Fox kits depend on mother’s milk when first born. It was endearing to witness that intimate moment between the babies and their mother each time she returned to check on her young. 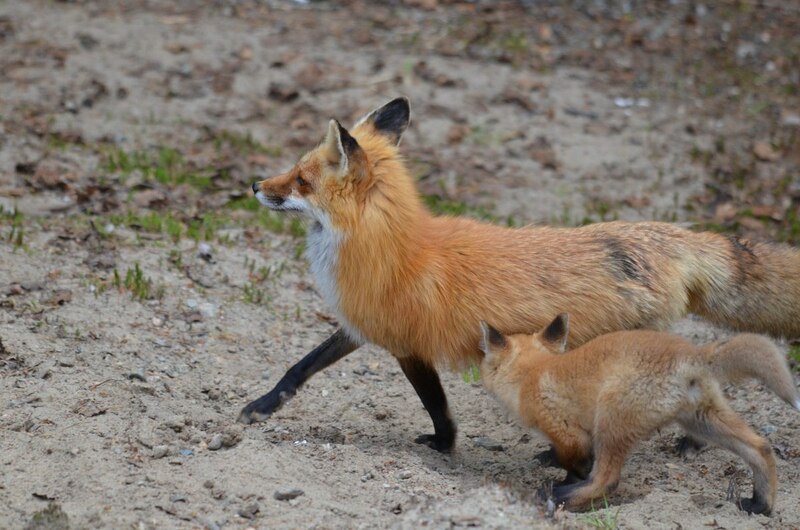 Never far from their den, each kit rushed to reach their mother first and then to latch onto a teat. and sometimes outsmarted their mother in order to get a quick drink. The dog fox was nowhere to be seen in the vicinity at that particular time, so we could only presume that he was off hunting in order to provide for his hungry family. 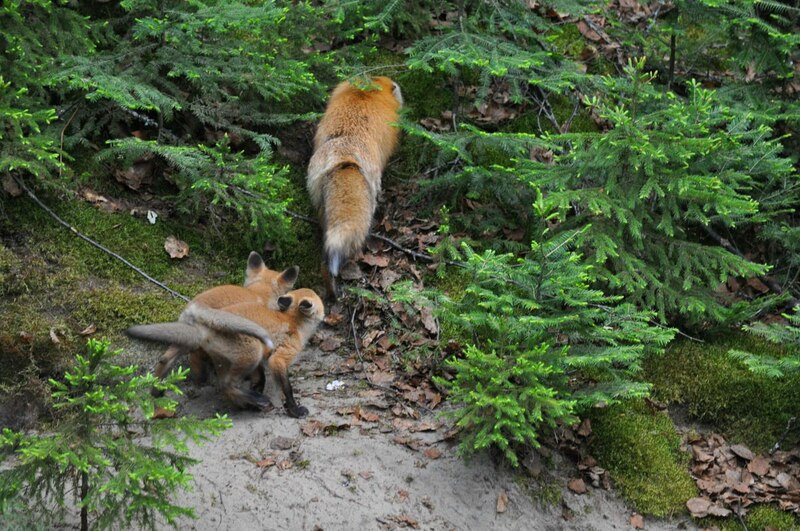 When the vixen tired of nursing the kits, she led them up onto the ridge and then went off to forage herself. Bob and I had to chuckle when this one determined cub came back our way and began rooting in the sand in search of tidbits. It came up with its nose amply covered in dry dirt, perhaps an inadvertent yet helpful deterrent against the pesky mosquitoes. As Bob and I sat in the dappled shade, we were so relieved that we had remembered our bug hats and jackets when leaving our campsite. The mosquitoes were amassed on my socks so thickly that you’d swear I had picked up hundreds of burrs; the white was now spotted with red, and around my head, the whine from their wings was what you would expect to hear when in the Amazon jungle. Still, we endured, happily taking in the antics of the foxes. As the saying goes, while the cat’s away, the mice will play. 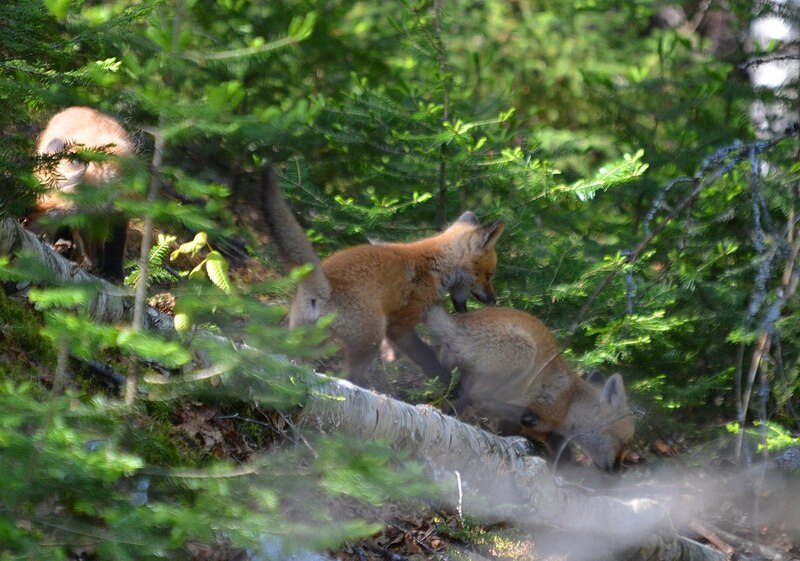 Well, without mother Fox to round them up, the Red Fox kits bounded down the hill to the open space in front of the den. 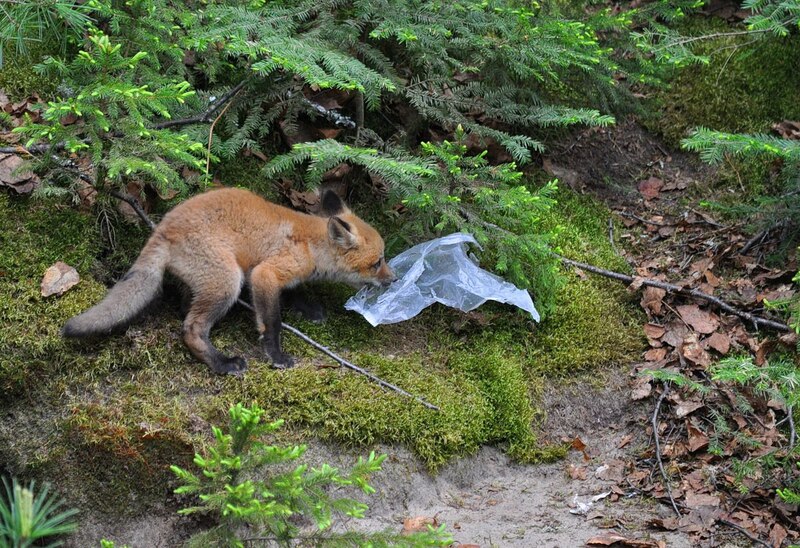 One of them showed up with a plastic wrapper that seemed to hold particular interest for the others as well, perhaps because of the crinkly noise it made. 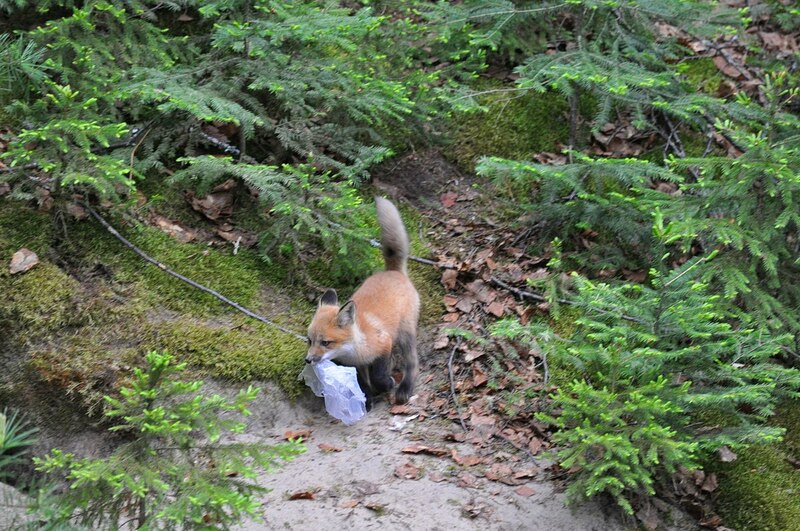 I was disgusted to see the garbage in the area, and just as relieved when the kits abandoned it in favour of more boisterous roughhousing. All games were quickly abandoned when the vixen returned to the den from her hunting expedition. One kit was more alert than the others and was at the mother’s side before the other cubs knew what was happening. 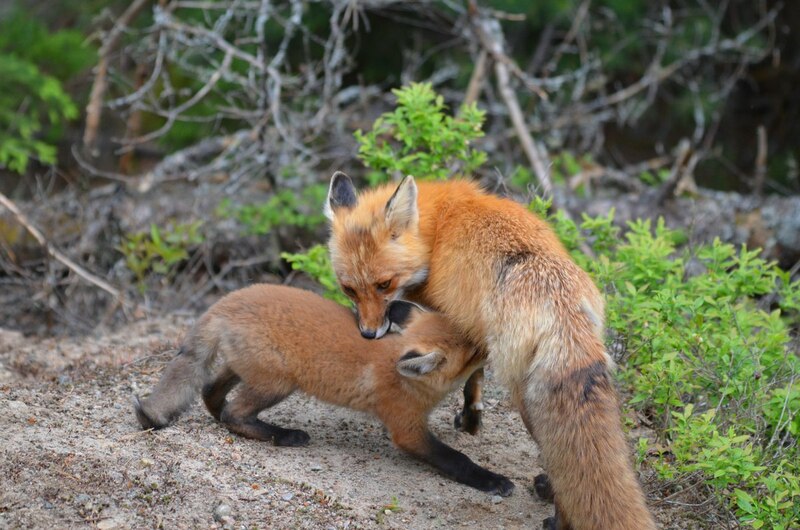 At this stage of a kit’s life, a mother Fox starts offering pre-chewed food to her babies. 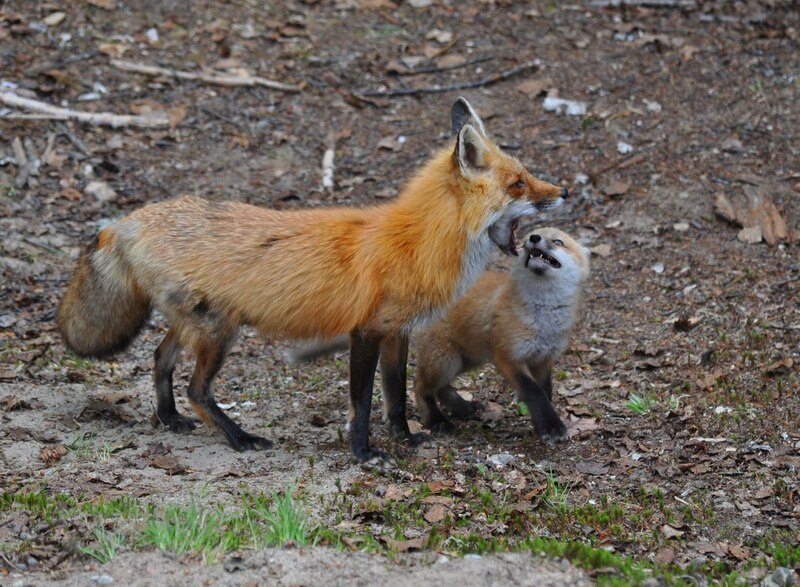 In this case, it appeared that the vixen smelled of a fresh kill because the kit immediately set to licking its mother’s mouth in anticipation of some juicy morsel being regurgitated. In a matter of seconds, the kit had savoured the tasty offering and was scouring the leaf litter for any morsels that had been dropped. 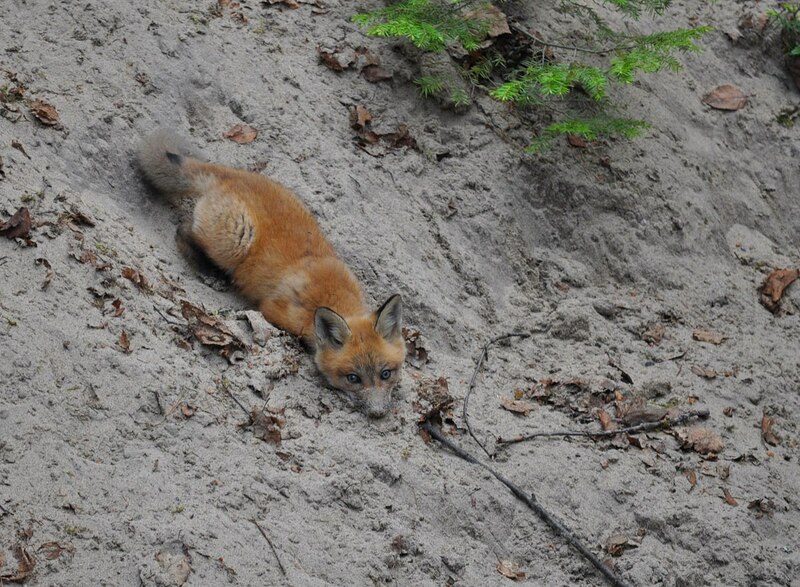 Over the next few months, the vixen and dog will bring home live prey so that the cubs can develop their hunting skills as they play with their food and then eat it. 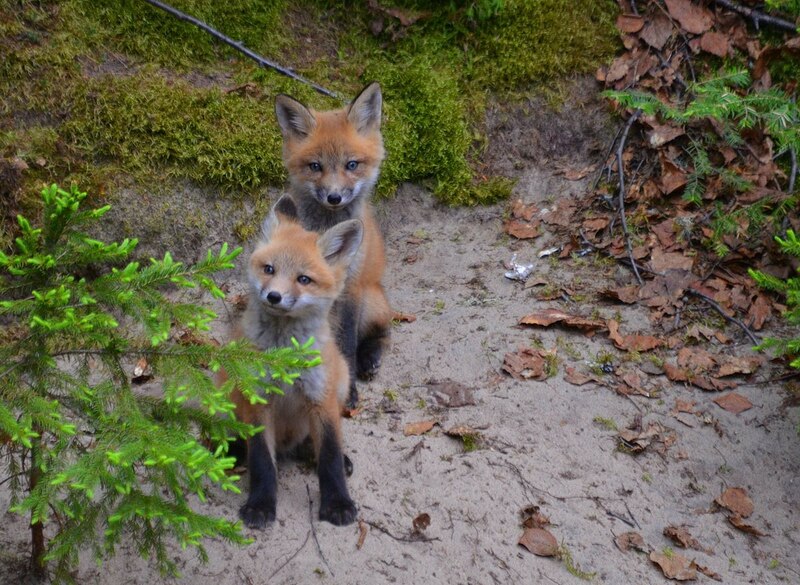 By the age of seven months, the Red Fox kits will have the ability to catch food for themselves and will leave their parents in search of their own territory. For the duration of this particular wildlife encounter, Bob and I were just delighted to witness the tenderness displayed by the vixen towards her kits. Even though they grow quickly, at least for the time being they seemed totally defenseless and adorably innocent. 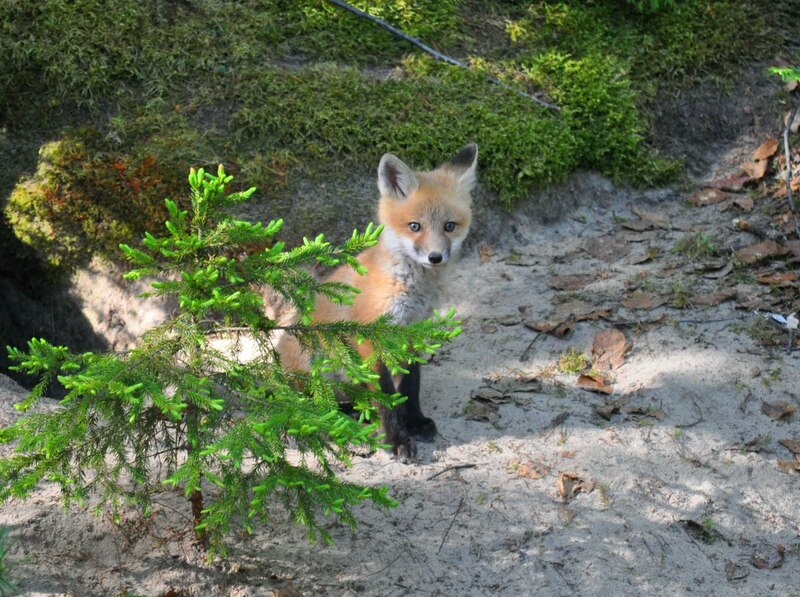 oh my goodness..so adorable..my sister just told me about Yurts in Algonquin park. This is amazing. Bob and I really enjoyed camping in the yurts. They make for quite a different experience, and for anyone who lacks all the camping gear necessary for regular camping in a tent, it is a very handy alternative. 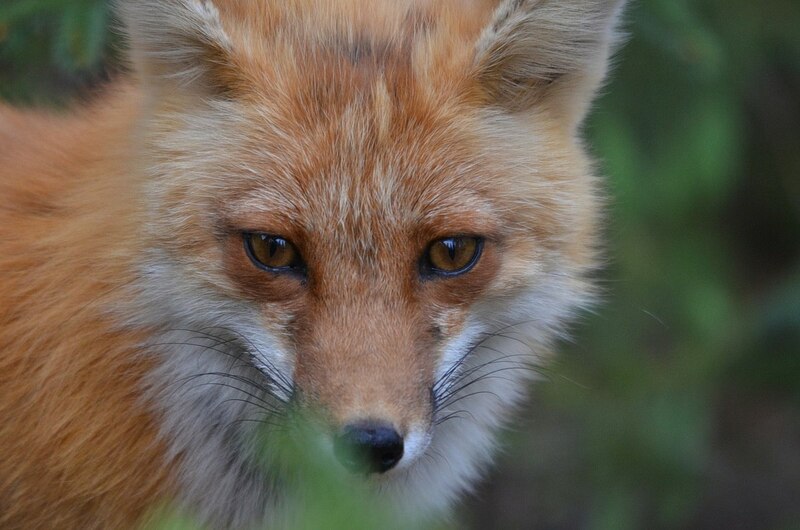 We completely adored our time spent with the foxes.